(*If any security features (DRM) are turned on by the creator of a PDF document, the PDF file will likely not be included in the search index. More specifically, any PDFs that disallow copying text/graphics or prohibit the ability to print the document will not be searchable.) To search all of your workspaces, simply type in a term in the search box at the top of the page and select the option "Search for ______". To search within a specific Workspace, type in a term in the search box while in that Workspace and select the option "Search for ______ in name of the workspace". By default, an OR operator is added to multiple-word searches. So, in the above example, results would be returned for items containing "Penske" OR "File". To perform an "exact phrase match" search, put your search string in quotes, i.e. "Penske File". All queries by default will only return pages that contain all of your search terms. Order of search terms will NOT affect search results. iMeet Central searches are not case sensitive. Newly uploaded documents or added content may take up to 15 minutes for them to appear in the search index. Items in a shared folder will display as being in the origin workspace. Adding a time value when searching (for instance "11am") will prompt you to create an event in your search results. To perform an Advanced Search based on multiple criteria, click the Advanced Search link to that populates once you begin typing in the search box. You should see something like the below. As shown, Advanced Search lets you search for exact phrases ("these exact phrases"), and exclude results with words you specify ("none of these words"). 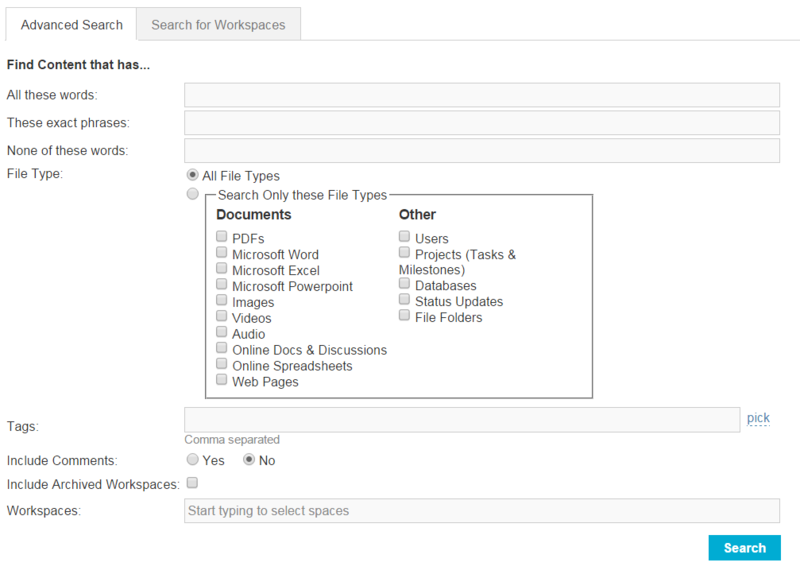 Also, you can filter your results by file type, tags, "including archived workspaces" and workspace.